SNHR stated on the International Day for the Elimination of Violence against Women that the violence inflicted on Syrian women is unmatched in any other part of the world in light of the ongoing, continuously escalating nature of the ferocious and systematic brutality inflicted by the parties to the conflict in Syria, first and foremost by the Syrian regime and its allies. Entitled, “A Suffering Syrian Woman is a Recipe for a Torn Country and Displaced Society”, SNHR’s report notes that Syrian women and girls have been subjected to the worst of the suffering inflicted on all parts of Syrian society over the past eight years in Syria, particularly since the beginning of the popular uprising for freedom in March 2011 which was further exacerbated by added psychological, social, and physical burdens. In addition, there have been certain regressive societal structures and social norms conventionally associated with tradition, customs, or religious interpretations some of which normalized a discriminatory worldview and behaviors amongst some sections of society against Syrian females. These have been used by some to legitimize and justify violence and discrimination against women and girls. The report includes the toll of violations perpetrated by the parties to the conflict in Syria against females between March 2011 and November 25, 2018, as well as summarizing the most notable of these violations, focusing particularly on those perpetrated over the course of the last year. The report draws upon SNHR’s database, established in March 2011, which has been regularly updated ever since. SNHR’s database compiles evidences, information, and data for incidents that the group has verified after receiving reports from various sources, including victims, eyewitnesses, activists, and other sources amongst an extensive network of relations SNHR established with local communities across Syria. The report contains nine accounts by female survivors who experienced various patterns of violations, including arbitrary arrest, torture, sexual violence, and discrimination, as well as accounts by eyewitnesses and victims’ families. The report notes that the overwhelming majority of the female victims of these crimes were civilians, with only a small minority of those affected having been active in the conflict as fighters involved directly in hostilities or as members of reserve units either voluntarily or forcibly. The report documents that 27,226 females, divided into 11,889 female children and 15,337 adult females, were killed at the hands of the parties to the conflict in the period covered by the report. Of those, 21,573 were killed by Syrian regime forces, 1,231 were killed by Russian forces, 926 were killed by international coalition forces, and 1,301 females were killed by factions from the armed opposition. In addition, extremist Islamic groups have been responsible for the death of 922 females – 844 of these were killed by ISIS and 78 by Hay’at Tahrir al Sham, while Kurdish Self-Management forces killed a further 220 females. Lastly, 1,053 females were killed by other parties. According to the report, no fewer than 9,906 females are documented as still being under arrest or forcibly disappeared at the hands of the parties to the conflict in Syria between March 2011 and November 25, 2018, including 8,057 in Syrian regime custody, 911 in armed opposition factions’ prisons, 489 in extremist Islamic groups’ prisons, and 449 still detained in Kurdish Self-Management forces’ prisons. The report adds that 89 women (adult female) died due to torture, including 71 who died in Syrian regime’s prisons, while 14 died in ISIS’s prisons, two in Kurdish Self-Management forces’ prisons, one in a prison run by armed opposition factions, and one who died at the hands of other parties we couldn’t identify. The report notes that women enjoy both general and special protection established in Geneva Convention IV, as well as Protocol I and Protocol II as civilian individuals not taking part in hostilities. Women also enjoy all the rights stated including the right to life and the right to physical and psychological safety. The report stresses that acts of systematic killing practiced by Syrian regime forces in a widespread manner across Syrian governorates constitute crimes against humanity. In addition, the indiscriminate bombardment constitutes daily war crimes that are still continuing. The report adds that the Syrian regime practices sexual violence as an effective deterrent weapon against society, and one which has become a phenomenon with dire consequences for its victims, particularly women and girls, as well as their families and wider communities. Many such incidents have yet to be documented with the victims understandably not feeling confident enough to reveal the details of their ordeals, in most cases out of fear of retaliation, shame, or social stigmatization. The report notes that Self-Management forces have carried out acts that constitute war crimes through indiscriminate shelling and willful killing. All of these crimes are regarded as blatant violations of international humanitarian law. As a de facto authority, the party should adhere to the standards of international humanitarian law. According to the report, ISIS and Hay’at Tahrir al Sham have both carried out the crime of killing in indiscriminate shelling operations, which constitute war crimes and violations of international humanitarian law. ISIS has also tortured and enslaved women in a widespread manner which constitutes a crime against humanity. Moreover, the practices carried out by ISIS and Hay’at Tahrir al Sham in their respective areas of control constitute violations of Article 3 of the Geneva Conventions and constitute war crimes. Factions from the armed opposition have also committed the crime of killing, with their indiscriminate shelling operations also constituting war crimes and violations of international humanitarian law. The report calls on the Syrian regime to lift its reservation on the CEDAW treaty and immediately cease the acts of willful killing, torture, and arrest against Syrian women. Additionally, the report calls on the Syrian-Russian alliance and Iranian militias to cease deliberate bombardment of residential civilian neighborhoods and populated areas since these attacks result in civilian casualties, most of whom are women and children. Furthermore, the report calls on International coalition forces to investigate the incidents that have resulted in the death of female victims in particular. Also, it states, the international coalition must apply pressure on its allies, particularly the SDF, to cease the conscription of female children, as well as abductions and arrests. The report stresses that all parties to the conflict must immediately release female detainees, specifically those who were arrested in the context of the armed conflict, and adhere to international laws that outlaw the detention of female children. In addition, the report stresses that the Security Council bears a responsibly to protect women in Syria from the Syrian regime which is the party perpetrating the most serious and major violations of every kind against Syrian women. 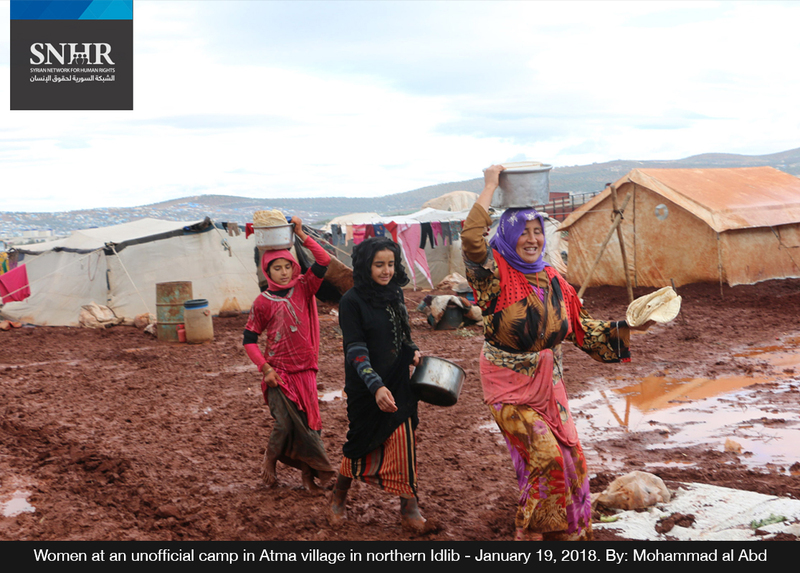 The report adds that the Security Council should apply pressure on the Syrian regime to ensure that international observers, including the Commission of Inquiry, are given unconditional and unrestricted access to women detention centers. Lastly, the report calls on the OHCHR to release a special report on the violations that Syrian women, in particular, have experienced.